Bible study yesterday explored the rest of the story of Stephen. We heard him look to the journey of the people of Israel and their relationship with God. We then drew maps of our journeys with God and with each other. The compelling question for us yesterday, we also offer to all of you: "When/where has God done a miracle in your life, or delivered you from a tough spot?" For our community, answering this question was a wellspring of surprise and hope. "Brimming with God's grace and energy"
We welcomed our new intern Windsor Jones to Bible study today. We have been talking about Acts of the Apostles and today's reading was about Stephen, a man "brimming with God's grace and energy." Everyone shared stories about the Stephens in their lives and communities who show love and compassion. Who are the amazing Stephens in your life? Have you thanked them today? It's that time again. Here is the latest edition of our church newsletter. "What deeds of power are being done by his hands!" Just how much good ministry can be done in one hour on a Sunday? If we let our hearts lead the work of our hands, we can welcome each other, pass out bulletins to each other, prepare coffee for each other, serve each other, bless each other, play music for each other, cut cake and and share a smile with each other, give peace to each other, receive from God and share with each other, pray with each other. All this by lending our hearts and hands as community. Thank you Lizzy for a wonderful year of sharing your heart and ministry with Church of the Common Ground. Blessings to you as you walk toward your new ventures. Thanks Christ Church Norcross for sharing our worship today! “...there is no God like you in heaven above or on earth beneath, keeping covenant and steadfast love for your servants who walk before you with all their heart"
The warm summer days are upon us. Our feet carry us through this world and grow weary when the sun beams hotly and the breeze comes not often enough. But, even in this blazing heat we know God's loving kindness at Common Soles where feet are washed and cooled and cared for. God's servants walking this life with all their hearts are restored and refreshed so that they may continue their journey. "I am the resurrection and the life..."
Last Thursday, seven members of the Church of the Common Ground community received their certificates for completing Peer-to-Peer Counseling training. This training program, led by the Rev. Brady Radford, was made possible by generous funding from the Episcopal Community Foundation of Middle and North Georgia. Peer-to-Peer counseling training has helped the members who completed the program to better understand how to be present for each other in pastoral care. The training provided tools that members can use when called upon to be God's loving presence for others. Congratulations to our amazing Church of the Common Ground pastoral care givers! So many wonderful community experiences in June: a retreat to Koinonia Farms, welcoming a new intern to our group, and exploring what it means to be followers of Jesus as we learned about the Acts of the Apostles at Bible study. Below is a photo of a rained out Bible study where we took refuge at the Landmark Diner and ended the lesson with smiles and silly faces. 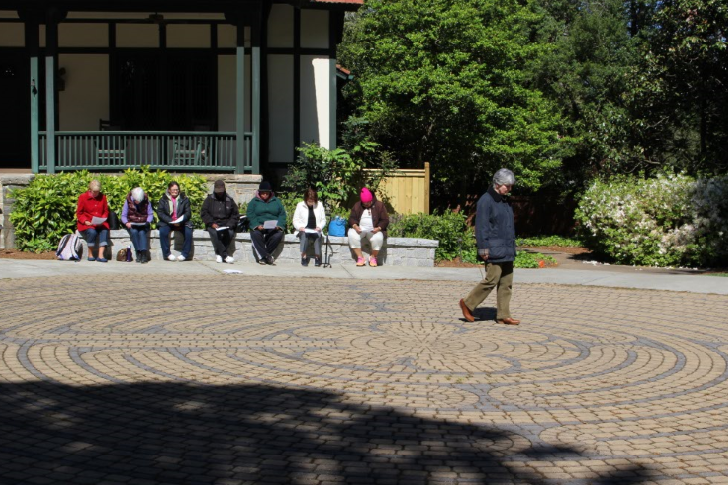 See more about our recent spiritual and community journeys in our June newsletter! Each week many volunteers help at our Common Soles non-medical foot clinic. They wash feet. They listen. They pray with others. They are present for others. Serving Christ in all persons is not always easy but is our call as community. 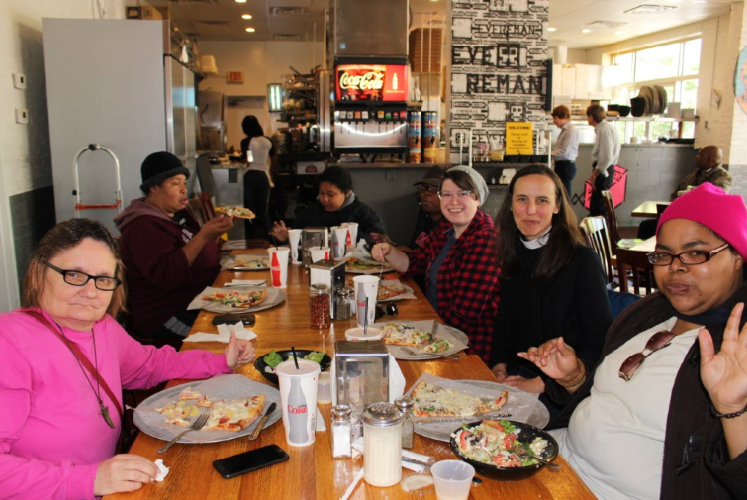 Church of the Common Ground is so grateful to the Common Soles volunteers...long time supporters like Lorraine, Peggy, Caroline and Jen, as well as newcomers like Maureen and Murdock. Bless you! And, sometimes serving Christ in all persons is making lunches for our volunteers after a hard morning of serving others. Episcopal Church of the Epiphany prepares lunches for our volunteers every week. Volunteers gather, pray, and share ideas on how to make our ministry better for all. Thank you Church of the Epiphany! "They agreed they were in this for good, completely together in prayer, the women included. " A little bit of rain just couldn't stop Bible Study in Woodruff Park on Wednesday. Despite a deluge earlier, the clouds parted and the sky brightened in time for our weekly gathering of scripture reading, lively discussion and fellowship. Marcus helped us wipe down the chairs so participants would not get wet. Others rearranged chairs in the shade. Slowly our group grew and contained friends old and new. Like the early church we gathered, we prayed, we encountered scripture and we reflected on what it means to be a follower of Jesus and members of a community. 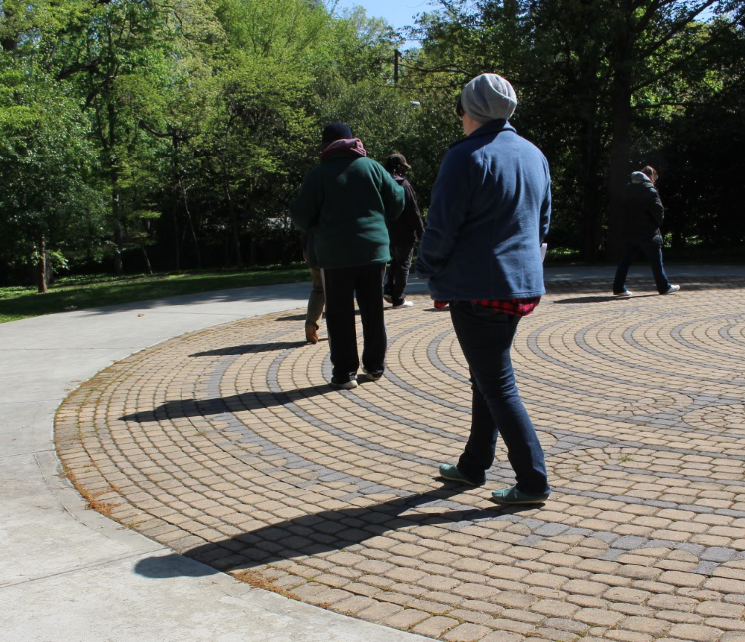 Every Monday and Wednesday morning, Church of the Common Ground meets at Central Outreach to participate in the ancient and honorable tradition of morning prayer. Gathered around a small wooden table with our ecclesia cross in its center, members read scripture, reflect on the world around us, pray for each other and for all God's people, and share in fellowship. Even on one of the busiest streets in downtown Atlanta, morning prayer invokes moments of quiet and calm. It is a testimony to the stillness of God's love even in the most unexpected of places. Church of the Common Ground has an open position for Associate Vicar. Please find the position description by clicking here. Inquiries about the position should be directed to The Very Rev. Monica Mainwaring. Some of the folks from Church of the Common Ground enjoyed a time of retreat to Koinonia Farms this past week. We enjoyed relaxing in the great outdoors, learning about this intentional community's role in Civil Rights, and touring their pecan factory. We delighted in tasting their chocolate pecan bark! Photos of our time together coming soon! The Lord's Prayer is said every Sunday and in the prayers of many even when it isn't Sunday. Sometimes what is so familiar benefits from experiencing it anew. 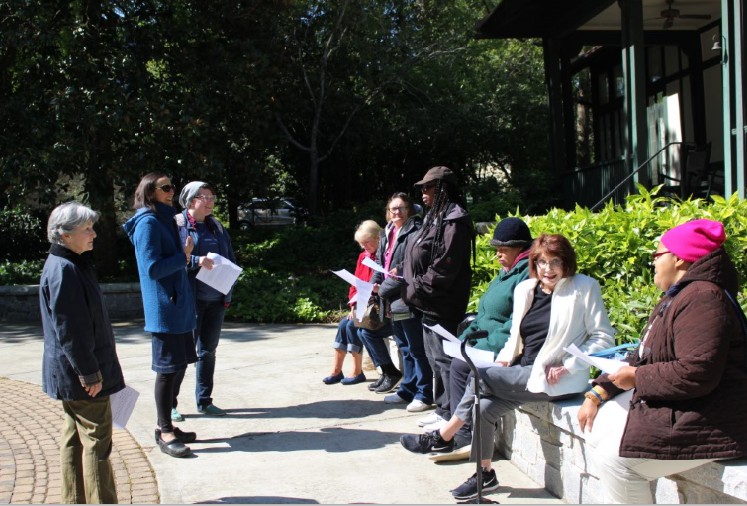 Lizzy Trawick, an Episcopal Road Fellow, led the Common Ground Bible study through an interactive exploration of the Lord's Prayer on Wednesday. We honored God, each other, and our hopes for God's Kingdom here on Earth with battery candles, lessons in geography, the sharing of wonderful yeast rolls, and a sacred washing of each other's hands. We ended with laughter and everyone taking a silly picture. 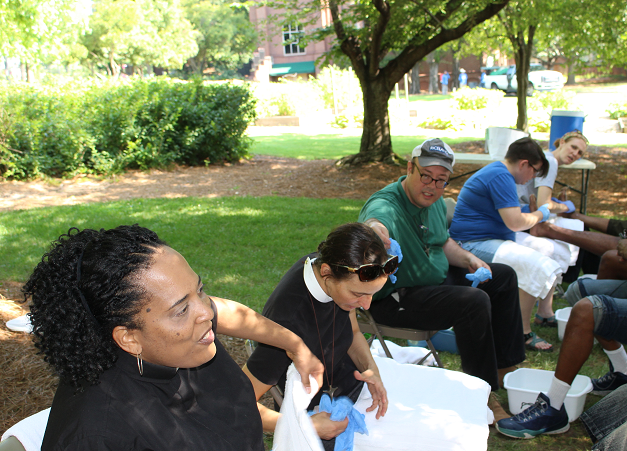 Bible study normally meets at Woodruff Park. Because Atlanta was so rainy on Wednesday, we also enjoyed hot coffee and soup at the Landmark Diner instead of the park. Our friends at the diner are always so kind to us when the heavens bring forth rains and storms. On Mother's Day Sunday, Church of the Common Ground also celebrated birthdays. Our friends at All Saints' Episcopal Church brought cake and fellowship shared by all. Thank you! Later that evening members of Church of the Common Ground journeyed to All Saints' Episcopal Church to take part in a special service of healing. Mother's Day is joyous for so many but can be a difficult day for others. In fellowship with others, Common Ground paid witness to the hearts that hurt on that day. 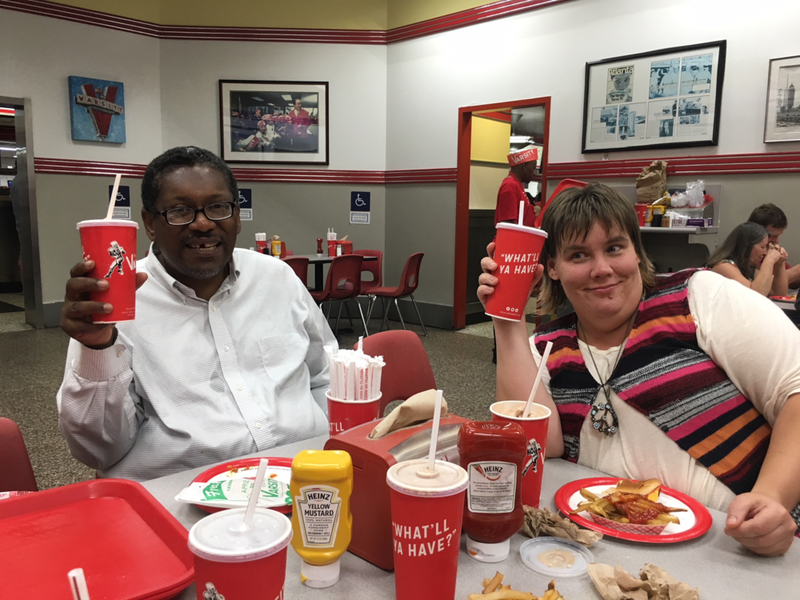 In true Common Ground fashion, we then celebrated our community and fellowship with a bite to eat at the Varsity. On the second Sunday of each month, Church of the Common Ground celebrates birthdays and distributes its monthly newsletter. The May edition anticipates the celebration of Pentecost and features some of our congregation sharing their ideas about "What Is Church?" Church of the Common Ground celebrates worship every Sunday at 1pm in Woodruff Park in downtown Atlanta, GA. Join us! Bible study has taken some creative journeys recently. Not long ago, participants used collage to express their personal stories. Inspired by the psalmists of old, Common Ground Bible study attendees used cut out images and words to craft a visual representation of their stories. We have spent time at Bible study recently reflecting on how the psalmists help to tell the stories of the human heart's experience. When reflecting on Psalms 16 and 121, our community drew pictures and wrote poems about loss and grief. The sharing of life's journey in community is such a blessed experience. Here is the latest news from Church of the Common Ground. Each month we celebrate birthdays and distribute our monthly newsletter. There is always so much love and fellowship shared in our community.